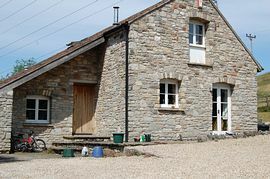 Butcombe Farm offers quality self catering accommodation in beautiful rural North Somerset, an ideal setting for a relaxing rural vacation. Set amid 30 acres of field and woodland, Butcombe Farm is a grade II listed house, dating from the fourteenth century and commanding a splendid view across the valley to the Mendip Hills. The cottage has just been updated with a neutral palate and now has the perfect combination of picturesque exterior with a bright, comfortable contemporary interior. This property offers a holiday setting combining modern and convenient facilities, with the peace and tranquillity of a rural environment. Three double bedrooms all with en-suite bathroom. A large lounge with French doors opening on to the patio and rear garden. A patio and large rear garden. A separate kitchen-dining room. Within an easy drive are the historic port of Bristol, with Brunels SS Great Britain and Clifton Suspension Bridge; Bath and its glorious Georgian architecture and Roman Spa Baths; and the delightful town of Wells, with its magnificent medieval cathedral. Nearby are the spectacular Cheddar Gorge and Wookey Hole - both famous for their caves; the Victorian seaside resort of Weston-Super-Mare; and Glastonbury, with its' pagan heritage, the famous Abbey and Tor and the legend of King Arthur. In addition to exploring the local countryside on foot, or touring by car, opportunities for activity abound, with fishing on the nearby Blagdon, Berrow and Chew Valley Lakes, horse riding at several local stables and clay pigeon shoots at various sites close by. A patio and a large rear garden. Access to the pool. Minimum: £610 and Maximum £800. All bookings have an £18.00 booking fee as well. VisitBritain rating due Spring, Autumn.